Our reseller / multiple domain hosting services are a perfect solution if you would like to start your own web hosting company or if you have multiple websites that you wish to host. Our resellers have the ability to host unlimited sites, that means you can host as many domain names as you wish with no extra fees! The only limits you have to keep in mind would be the diskspace and bandwidth. Unlike other hosting providers that offer reseller plans, the space and bandwidth limits above are calculated on actual usage, not allocation. This means that in the long run you will pay far less with iVhosting than you will with other providers. Be very careful before signing up with our competitors and make sure you ask them if they calculate disk space and bandwidth based on usage or "allocation." Usualy this is called "overselling" and yes, we allow that as described here. You have a reseller hosting account control panel called Web Host Manager. WHM is where you go to create your customer accounts. After filling in their account information you click "create". This will instantly set them up with their very own control panel called cPanel. This is where they will go to administer their website. Once they are logged into cPanel they can create subdomains, email accounts, change passwords and much much more without requiring any help from you or us. Being a reseller is completely anonymous allowing you to act as an independent hosting company. Your customers won't know that you are reselling our hosting unless you tell them. To ensure that your hosting clients do not find out that you are a reseller of ivhosting.com, we use anonymous domain names for our reseller servers hostnames. As an example, rather than naming a server srv6.ivhosting.com we would name it srv6.somethinganonymous.com. This same anonymous domain is also used to provide anonymous DNS servers to all resellers, so that instead of telling your customers having to point their domain names to dns1.ivhosting.com, they can point to dns1.somethinganonymous.com - although we can set for you private nameservers and you can use your own nameserver addresses/names anyway. The standard in web hosting control panel systems is cPanel/WHM. With all reseller hosting plans, iVhosting provides you this powerhouse of a control panel platforms. 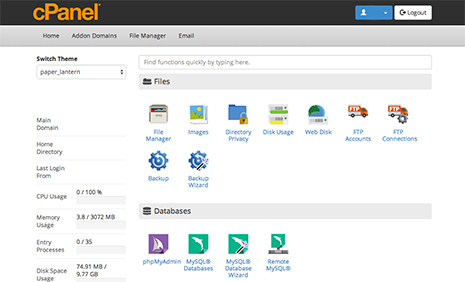 With cPanel/WHM installed on your hosting package, you can easily manage multiple web sites. 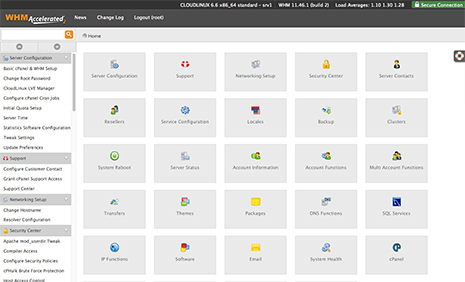 A cPanel control panel is assigned to each and then you use WHM (Web Host Manager) to control your collection of cPanel accounts you create. It is the perfect way to manage multiple web sites for multiple clients. Included with every account you create allows you to control the individual aspects of each individual web site. You can add e-mail accounts, read webmail, view site statistics, add subdomains, create databases, setup shopping cart and a whole lot more. The WHM panel allows you to add new accounts, delete accounts, suspend accounts, change accounts, view bandwidth usage for your entire reseller account and manage all the upper level aspects of your client sites. ... and hundreds more ready to install with simple steps! How long does it take to activate the account? our reseller hosting account will be manually set up usually within 1-4 hours (no more than 24 hours guaranteed) since we receive payment and all account details will be sent to You. Can I upgrade my account to a higher plan? Yes, at any time You can upgrade. Just let us know in support ticket to which reseller hosting plan you want to upraged and we will upgrade your plan an billing accordingly.